Jerry was my grandfather’s daughter, Leonard was her husband. Laverne was my grandfather’s son who was in the Army Air Corp. In 1943 my paternal grandmother, Frankie Ruth Fuller Pyatt Dourte, was living in St. Helena, California. At that time her only son (my father, Earl E. Pyatt) was in the Philippines at the start of the WWII, was part of the Bataan Death March and was being held as a POW. At the start of this diary, she had yet to receive word about his status. He was only 20 years old. She was married to my Dad’s step-father, Harley O. Dourte. They both worked at the Mare Island Naval Station. Harley had 3 sons of his own who were in the military. They moved to St. Helena because they were sure that when their boys came back they wanted to be near to where they would most likely return to the U.S. Her short, brief diary entries give a little glimpse of what her life was like during this time. On the days she has an entry I will post it. Carl was Harley’s brother who lived in St. Helena at the time. Charles Alfred Pyatt (1896-1985), my paternal grandfather, was a young man of 22 in 1918. World War I was in full force across the sea in Europe. He was inducted into the Army on May 28, 1918. He became part of the 88th Division, 349th Infantry, Company “M”. The 88th Division originated and was trained at Camp Dodge outside of Des Moines, Iowa. Company “M” of the 349th Infantry left the United States aboard the RMS Olympic (the Titanic sister ship) out of New York on August 9, 1918. They arrived in Southhampton, England on August 16, 1918. Over the next few days, they boarded ships to Le Harve, France. Excerpt from the book “The 88th Division in the World War 1914-1918”. (See reference below). The war ended November 11, 1918. But the 88th would have to wait for transportation back until May 1919. The troops initially received more military training but commanders soon realizing this training would not benefit the troops once they returned to the United States. 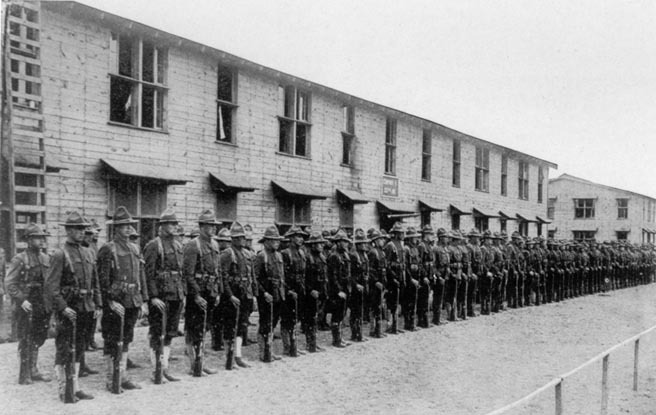 A new school was built for training troops in agriculture, automotive repair, carpentry and various trades that would prepare them for their return to civilian life. Many took this opportunity to see Europe with many leaves granted to the men allowing them to visit Britain, Spain and various other countries. On May 19, 1919, the 349th Infantry was among the first of the 88th Division to leave France and return to the United States. Company “M” departed aboard the SS Rijndam at St. Nazaire, France and returned to Hoboken, New Jersey on May 30, 1919. Troops boarded trains back to Camp Dodge where they were returned to civilian status and many then returned to their previous lives. **I discovered this book on Google Books. Click here for the link to take you to this book. On page 135 I found my grandfather’s name and hometown listed among the roster of men in the 88th Division, Charles A. Pyatt, Chetopa, Kan. I also found another “Pyatt” on the roster, also in the 349th but in Company “F”. James W. Pyatt, Gladden, Mo. After researching I have discovered that James is Charles’ cousin. They were both on the Olympic together traveling to France and on the Rijndam on the way back. Somehow it gives me comfort knowing that my grandfather was with his cousin during this episode of his life.